I work for or provide services to the Wikimedia Foundation, but this is my personal account. Edits, statements, or other contributions made from this account are my own, and may not reflect the views of the Foundation. For my alter ego working at the Wikimedia Foundation, see @Qgil. Qgil awarded T154761: "Register" newsletters instead of "Create" a Yellow Medal token. QuimGil added a comment to T206888: [Bug] Partial text appearing for Catalan Wikipedia . QuimGil moved T64702: Extension:Translate's languages box should look like interwiki language links from To Triage to Not ready to announce on the User-notice board. QuimGil added a comment to T64702: Extension:Translate's languages box should look like interwiki language links. QuimGil added a project to T64702: Extension:Translate's languages box should look like interwiki language links: User-notice. QuimGil awarded T64702: Extension:Translate's languages box should look like interwiki language links a Love token. QuimGil added a comment to T187834: Username not recognized by the extension. QuimGil added a comment to T187832: Trying to update the list of publishers resulted in me doing vandalism instead. This looks like the counterpart of T175497: Fields of newsletter not being updated in the newsletter info page (your own update triggered something that finally unblocked the update that got stuck somewhere for months). QuimGil added a comment to T178743: Remove code duplication in EditPage and NewsletterContentUpdate. QuimGil awarded T146750: Wiki(pedi&dat)a RSS user manual updates & IFTTT Flask application UI improvements (on Toolforge) a Love token. QuimGil added a comment to T183189: Special:Newsletter/id/subscribers does not properly update subscriber count. One question, does the number of subscribers get out of sync after adding/removing someone manually only temporarily and then re-syncs, or are manual removals/additions cause the number of subscribers to become false, permanently out of sync? QuimGil awarded T175895: List of subscribers to a Newsletter is not presented logically a Yellow Medal token. QuimGil awarded T180987: Inconsistent descriptions in the Newsletter interface for creating and unsubscribing a Yellow Medal token. QuimGil added a comment to T178746: Notification of failed login attempt triggered by Wikipedia Android app (beta)?. (I didn't test every day as I promised but) Yesterday night it happened again. This time I was clicking a link from a Google Hangout chat in my mobile device to https://en.wikipedia.org/wiki/Wikipedia:Arbitration_Committee/Noticeboard. The link activated the Wikipedia app, and a few seconds after I got the email about the Failed Attempt. QuimGil added a comment to T175895: List of subscribers to a Newsletter is not presented logically. The patch has been merged. Is this task Resolved? QuimGil merged task T181111: Supporting wiki-markup in the newsletter descripton into T175280: Make the description wiki-parsable. QuimGil merged T181111: Supporting wiki-markup in the newsletter descripton into T175280: Make the description wiki-parsable. QuimGil awarded T180392: Newsletter notifications should be Notices instead of Alerts a Yellow Medal token. QuimGil added a project to T180979: List of Newsletters should have a column showing the number of issues: Google-Code-in-2017. QuimGil closed T180443: Be able to define a specific group of users as Newsletter admins instead of manual list of users as Declined. Thanks. Declining this task for now. We can reopen it in the future if we have real use cases being limited by the current functionality. QuimGil triaged T180982: Individual newsletter pages should have a visual hierarchy as Low priority. QuimGil triaged T180980: Special:Newsletters should have a help link to Help:Extension:Newsletter as Normal priority. Totally, thank you very much. QuimGil triaged T180983: Newsletter issue announcements should be formatted in a more human-readable way as Low priority. You are right, but I believe the current list of issue announcements is literally a log. Does someone know how difficult would be to parse this information as @Ckoerner suggests? QuimGil triaged T180984: When announcing a new Newsletter issue, allow for full URLs (and automagically remove the static URL) as Low priority. This is of course a very good idea. I wonder how complex the implementation is. QuimGil added a comment to T180985: When announcing a new Newsletter issue, provide in-line help for the requested fields. Yes, this would be a good improvement. Would you like to volunteer the texts, so a Google-Code-in-2017 student can make a straightforward implementation? QuimGil added a comment to T180986: When creating a new Newsletter issue, provide in-line help for the requested fields. QuimGil added a project to T180987: Inconsistent descriptions in the Newsletter interface for creating and unsubscribing : Google-Code-in-2017. Thank you, good catch! Yes, "page" is better. QuimGil added a comment to T180990: The table listing all Newsletters should include more features for discoverablity. Thank you for these ideas! Let's see. QuimGil added a comment to T180443: Be able to define a specific group of users as Newsletter admins instead of manual list of users. All MediaWiki.org syspos (administrators) have permissions to manage newsletters here and, in fact, anyone can post anything in any newsletter if they so wish. They only have to add themselves as publishers before (two clicks). I'm not sure about this. Until now we have followed the principle of giving permissions to those who need them. QuimGil added a comment to T177064: When creating a newsletter, the default newsletter page should be offered as Main Page. At least from a UX point of view, I see the behavior differently: the Newsletter page is by default the Special page about to be created, unless the user defines an existing wiki page. QuimGil added a comment to T174602: Double notification received for becoming a Newsletter publisher. QuimGil added projects to T180660: Enable Single edit tab in Catalan Wikipedia: Wikimedia-Site-requests, VisualEditor. QuimGil added a comment to T180392: Newsletter notifications should be Notices instead of Alerts. Thank you very much for working on this, @SimmeD ! QuimGil added a comment to T175069: A Newsletter publisher can announce a new issue without providing a title for it. A newsletter announcement consists of two fields only: a URL and a summary. I don't think it is too much to ask both? QuimGil added a comment to T153911: Fatal error when a newsletter sharing a main page with a deleted newsletter is deleted. When creating a new newsletter, Main Page is the page defined as the "home" of the newsletter. It makes sense that is is unique because one can assume ust one wiki page designated as wiki page related to just one newsletter. Then again, it would not be the end of the world if checking this uniqueness causes problems and we remove the check. QuimGil updated subscribers of T174667: Newsletter extension doesn't notify users when they are removed as publishers. The last patch has been waiting for a review 11 days. It's a pity, because a lot of work has been put in that changeset and its iterations. @Addshore could you help reviewing, please? QuimGil awarded T175511: New publishers are not automatically subscribed to their newsletters a Party Time token. QuimGil awarded T175645: Use CSS to set the width of cells at Special:Newsletters a Party Time token. Today it happened again, when QuimGil performed a search for Catalan Wikipedia from the app. I am going to try once per day from now on. QuimGil updated the task description for T178746: Notification of failed login attempt triggered by Wikipedia Android app (beta)?. QuimGil created T178746: Notification of failed login attempt triggered by Wikipedia Android app (beta)?. QuimGil updated subscribers of T110645: Interwiki support for Newsletter extension. @01tonythomas @Bawolff @Addshore I have tried to define the interwiki support feature in way that allows developers to discuss the technical implementation. Do you think that it is clear enough? QuimGil updated the task description for T110645: Interwiki support for Newsletter extension. QuimGil awarded T176670: [[MediaWiki:Newsletter-manage-newsletter-success/en]] i18n issue a Barnstar token. QuimGil added a comment to T166002: 'Wiki page to be linked as main page' field in the 'Create Newsletter' form is unclear. New text proposed above, in the task description. QuimGil updated the task description for T166002: 'Wiki page to be linked as main page' field in the 'Create Newsletter' form is unclear. QuimGil added a comment to T110645: Interwiki support for Newsletter extension. It's not that users needing urgently a newsletter don't have options. 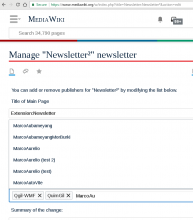 You have created a newsletter in MediaWiki.org that is serving Hebrew Wikipedians, and you can also create a newsletter in he.wiki distributed with MassMessage, like newsletters in Wikimedia have been doing and continue to do. QuimGil awarded T174667: Newsletter extension doesn't notify users when they are removed as publishers a Party Time token. QuimGil updated the task description for T177825: No on-site Notifications received for certain type of actions. QuimGil added a comment to T174664: Support interwiki links for new Newsletter issues. As suggested in the description, why not emulate how VisualEditor handles links? The "Search" tab for MediaWiki and interwiki pages only, not the external links. Plain users and plain publishers not finding each other. A single list with all the newsletters reduces that risk. QuimGil added a comment to T177825: No on-site Notifications received for certain type of actions. Confirmed. Notifications about new Newsletter issues are not arriving. On ca.wiki it is reported that it works saving user preferences with some change. I tried changing notification to email, then changing back to "web" and now it is working for me, both notification for mention and structured discussion. How exactly the partial deployment can make the problem bigger? @Bawolff I am not sure the interwiki notifications are the problem. Currently users are already getting Newsletter notifications in their wikis when they are not MediaWiki support, thanks to plain interwiki Notifications. T175279: Add the newsletter description to interwiki bundle notification is a problem, but maybe the solution lies in the Notifications framework, not in the interwiki support for Newsletter extension. A pity, but you are the boss, of course. QuimGil added a comment to T177151: Deploy Extension:Newsletter on hewiki. I just published a new MediaWiki-extensions-Newsletter issue. Some of notifications in email arived, some didn't. Or... maybe the question is simply how hard would it be to whitelist *:? How hard would it be to whitelist phab:? Note that T176199 is a different kind of request, because office.wikimedia.org is a stand-alone (not SUL) and private wiki. Therefore, the interwiki problem doesn't apply there. Hi, sorry, the Newsletter extension cannot be deployed to other Wikimedia wikis until we have figured out how to solve T110645: Interwiki support for Newsletter extension. A key value envisioned for this extension is to have a single catalog with all the newsletters, so users can check the one and only list and find everything there. If we start enabling this extension before the interwiki question is solved, we will have dozens of catalogs of newsletters spread all over. QuimGil added a parent task for T110645: Interwiki support for Newsletter extension: T177151: Deploy Extension:Newsletter on hewiki. QuimGil added a subtask for T177151: Deploy Extension:Newsletter on hewiki: T110645: Interwiki support for Newsletter extension. QuimGil updated subscribers of T135237: Allow editing old version of Flow description. For what is worth, fixing descriptions (trying to see the difference when a suspicious edit comes and restore a previous version if it was vandalism indeed) is an unpleasant task. It needs to be done manually, takes time, and makes you miss a revert link. This needs to be done with reasonable frequency in MediaWiki.org or Catalan Wikipedia, and I suspect other wikis with SD enabled. The more SD expands, the biggest this problem will become. QuimGil created T177064: When creating a newsletter, the default newsletter page should be offered as Main Page. QuimGil added a comment to T175932: Add a "watchlist" icon next to the Echo ones. I support this suggestion, In fact, I came here to report it and then I found this task. QuimGil created T177046: Notification of new messages is always gray in Timeless skin. QuimGil merged task T176435: Description for Newsletter² stuck into T175497: Fields of newsletter not being updated in the newsletter info page. QuimGil merged T176435: Description for Newsletter² stuck into T175497: Fields of newsletter not being updated in the newsletter info page. QuimGil updated subscribers of T175645: Use CSS to set the width of cells at Special:Newsletters. @Eugene233 you asked me via chat, but then I have thought a bit more, and... Considering that this is your first task for the Newsletter project, I think it is better that you upload a patch with the fix sooner than later. Since it is a quite visible change, I think writing tests here is not so important as to delay that first upload and the beginning of the code review. QuimGil triaged T175895: List of subscribers to a Newsletter is not presented logically as Low priority. QuimGil created T175895: List of subscribers to a Newsletter is not presented logically. QuimGil triaged T175282: The Newsletter subscribing page is aligned to left in rtl as Normal priority. QuimGil added a comment to T174667: Newsletter extension doesn't notify users when they are removed as publishers. 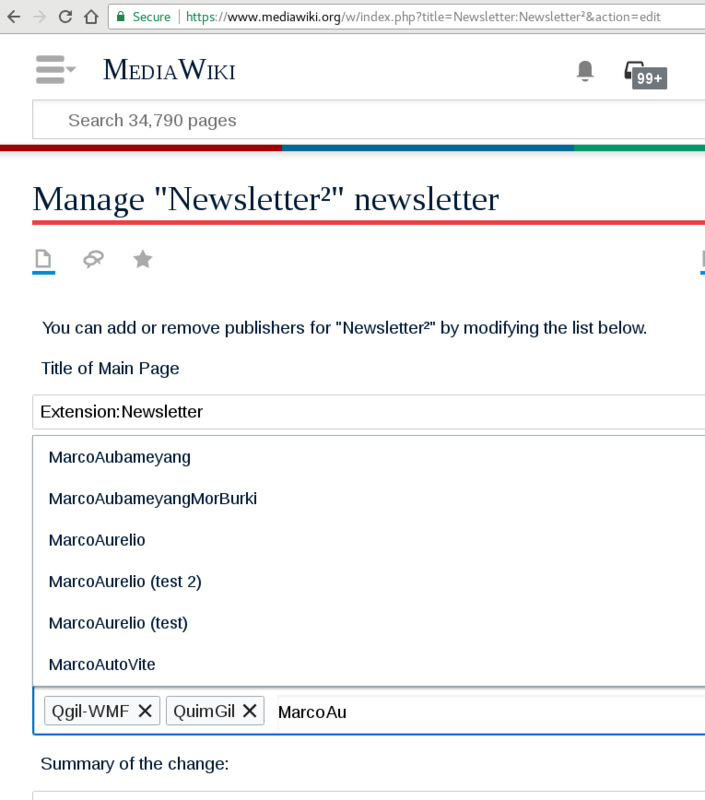 QuimGil moved T175645: Use CSS to set the width of cells at Special:Newsletters from Backlog to Confirmed on the MediaWiki-extensions-Newsletter board. Thank you @He7d3r for reporting, thank you @D3r1ck01 for promoting, and thank you @Eugene233 for taking this task. Good luck! If you have questions, please ask. QuimGil triaged T175279: Add the newsletter description to interwiki bundle notification as Low priority. First we would need to check whether the Notifications framework allows to do this. QuimGil added a comment to T175280: Make the description wiki-parsable. How do edit summaries parse wikitext, and could we use the same approach? Edit summaries accept wikitext links [[Some page]] that will be parsed as such in the page history and Recent Changes. However, http links, images, templates etc will not be parsed. QuimGil moved T175432: Newsletter summary length issues from Backlog to Needs discussion on the MediaWiki-extensions-Newsletter board. Maybe the solution is to simply use the same type of field that MediaWiki offers for edit summaries. It's a textfield and not a textarea, which in itself gives an idea of conciseness. It has a character counter that lets users know how many characters are left. QuimGil added a comment to T175497: Fields of newsletter not being updated in the newsletter info page. This is weird. Today I saw that the old description had reappeared in Special:Newsletters and the Manage page. What / who brought it back and from where, I don't know. QuimGil triaged T175511: New publishers are not automatically subscribed to their newsletters as Low priority. QuimGil created T175511: New publishers are not automatically subscribed to their newsletters. QuimGil triaged T175502: Please enable Flow in MediaWiki.org's Newsletter talk namespace as Normal priority. QuimGil created T175502: Please enable Flow in MediaWiki.org's Newsletter talk namespace. QuimGil raised the priority of T174667: Newsletter extension doesn't notify users when they are removed as publishers from Normal to High. QuimGil triaged T175432: Newsletter summary length issues as Low priority. QuimGil added a parent task for T175431: Allow name of Newsletter to be translatable: T175430: Allow translatable text in the summary of Newsletters. QuimGil added a subtask for T175430: Allow translatable text in the summary of Newsletters: T175431: Allow name of Newsletter to be translatable. QuimGil triaged T175431: Allow name of Newsletter to be translatable as Lowest priority. This request has some open questions common to T175430: Allow translatable text in the summary of Newsletters. A newsletter only needs a multilingual title when it has multilingual issues. For practical reasons, let's mark this task blocked by T175430 and let's start the discussion there. QuimGil triaged T175430: Allow translatable text in the summary of Newsletters as Low priority. From a subscriber point of view, what would decide in which language I receive the notification? An algorithm will have to decide, based on what? Unless subscribers are able to define a preferred language when subscribing, which would complicate things. The same question applies to T175431: Allow name of Newsletter to be translatable. QuimGil merged task T175429: Allow Special:MyLanguage links as Newsletter page title targets into T119090: Make it possible to announce to localized pages for new issues. QuimGil merged T175429: Allow Special:MyLanguage links as Newsletter page title targets into T119090: Make it possible to announce to localized pages for new issues. QuimGil updated subscribers of T175497: Fields of newsletter not being updated in the newsletter info page. Thank you @MarcoAurelio for finding this bug. The thing is, the list of newsletters and web/email notifications are not "page" like things. QuimGil triaged T175497: Fields of newsletter not being updated in the newsletter info page as Normal priority.